Whether you have a three month lead or are planning your wedding 18 months in advance, planning a wedding takes time. If your days at work are long and you have other commitments, working on all the details of your wedding day can be a daunting and overwhelming task. Let our wedding planners be your lifesavers. 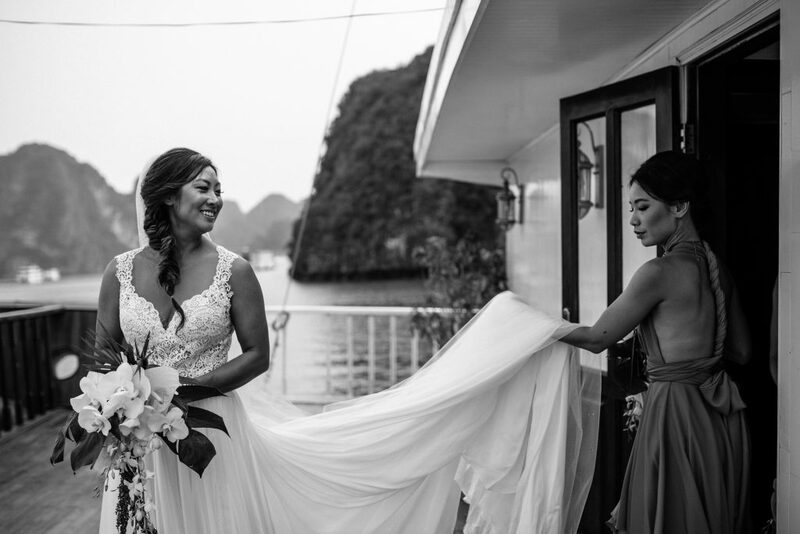 We are here to help you stay on top of your task list and co-ordinate all details of your wedding day here on the ground in Vietnam. Our wedding planners will guide you through the planning process and make sure that you haven’t forgotten anything for the big day. Whilst some resorts and venues do have in house planning services, these are mainly restricted to package weddings and are not bespoke. We are here to ensure that your wedding is unique and a reflection of you as a couple. Our inclusive planning fee includes your destination wedding week and all the required organization. This means that we will assist you with all aspects of your wedding from welcome dinners to bucks and hens days to recovery brunches and days out. Our planners are on site from first thing in the morning until the last guest goes home. Our focus is not only on food, beverage, and ceremony but on the whole experience for your guests. Searching for suppliers from abroad is no walk in the park, especially if you don’t speak Vietnamese, or know what to look for. Having to find vendors, communicate with them, AND co-ordinate them on your big day can amount to whole lot of stress. Flowers, hair & make-up, sound systems, entertainment, babysitters — and the list goes on. Our team has been working in the region for seven years and have found the best team of suppliers to support your wedding day, hassle-free. Our wish for you is that your big day is seamless, stress-free and memorable! Memorable because of the time you were able to share with family and friends – rather than memorable because you have had to worry about the details (large & small) of your day. Who wants to be chasing a supplier who turns up late, while checking that the flowers you ordered are the correct color, and when they are wrong making sure that they change them to get them right? On top of that, the power is out at the venue and your ceremony is in 30 minutes, you’re juggling last minute changes to your seating plan, and a faulty zipper on your wedding dress just wont go up! Things can and DO go wrong. Imagine having to deal with all that when instead you could be sipping champagne and enjoying the day with your friends and family. Let Hoi An Events take care of any challenge or changes that may arise on your wedding day. Our planners want your wedding to be the ‘best day of your life’. Weddings are not just about aesthetics. It is the collective experience that really wows your guests and leaves a lasting impression. Not only do we want it to the best day of your life – we want your guests to tell you that was the best wedding — EVER. We want to make sure they are moved to tears at your ceremony and have the party of a lifetime at your reception. Hoi An Events will take care of your friends and family as if they were our own. The greatest compliment we receive is when our couples tell us that they could not have had the wedding experience without our team. We love to hear that their wedding day was better than they could have ever hoped for. This confirms to us how essential a wedding planner can be and how it can make your wedding day the ‘best day of your life’. Being asked to plan a wedding becomes a very personal journey between the planner and the couple, and we do not take this role lightly. We are there from the beginning to the end to guide and support you every step of the way.